These are the best luxury midsize SUVs of 2019. The SUV is the vehicle of choice for many people—and for good reason. They have the seating capacity of a minivan, the strength of a truck, and the beauty of a sports car. No other type of vehicle can compare to an SUV, and luxury SUVs are the best of the best. The competition for the best SUV is fierce, and in the world of luxury SUVs, there’s no room for error. Our list features some truly great SUVs. The BMW X5 is one of the favorites on the road right now. Its sister model, the BMW X6, is a mix between a sports sedan and an SUV thanks to its steeply raked coupe-style roofline. Both the Land Rover Discovery and the Land Rover Range Rover Sport as so full of tech that we have barely scratched the surface of their amazing features. If you’re looking for storage, the Acura MDX has over 80 cubic feet! If you want speed, the Maserati Levante and the Tesla Model X are hard to beat. The Tesla Model X is also great for the environment, as is the Volvo XC90. If you want the best bang for your buck, try looking at the Buick Enclave. Starting at $40,000, it's the cheapest offering on the list but still has plenty of luxury features to compete in this class. No matter what type of SUV you’re looking for, we’ve got you covered. 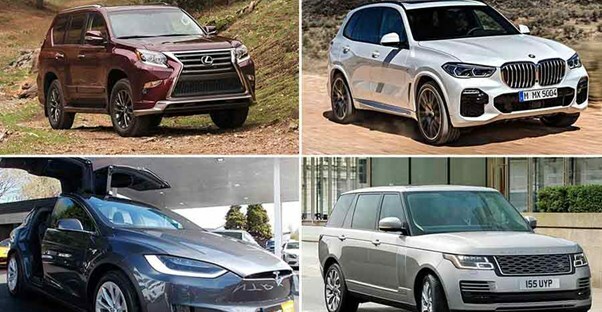 Read on to see which great 2019 luxury SUV you should drive home! At $44,000, 2019 Infiniti QX60 is one of the cheaper SUVs on this list. It comes with both Forward Emergency Braking with pedestrian detection and Backup Collision Intervention built in. Quilted semi-aniline leather seats and wooden accents make the interior of this car completely unique. It even has a Motion Activated liftgate so you can open the back hatch completely hands free. Even with all its offerings, however, it still falls far short of the segment leader in our eyes. The Lincoln Nautilus (formerly known as the MKX) starts at $40,340, making it one of the cheapest SUVs on our list. It comes with 4G LTE for your passengers and your Spotify music. A stunning grille, LED headlights, and chrome detailing draw attention everywhere you go. Then, you have features like Adaptive Cruise Control which slows the car as you approach traffic. But that feature, of course, is only available on more expensive trims. A dated center console design and mushy driving keep this luxury mid-size SUV from ranking higher on our list. The 2019 Cadillac XT5 has a starting price of $41,695, but things quickly become much more expensive if you want to match the features that competitors offer. That's the major ding against this mid-size Cadillac SUV. Otherwise, we were impressed with the interior design layout and materials of the XT5. Most of the impressive safety features are only available as add-ons, but a rear vision camera and rear park assist are standard on the base model. The Land Rover Discovery is a $52,950 SUV packed with so many features that Land Rover struggles to list them all. That’s why they’ve put out the Land Rover iGuide—an app that uses your phone's camera to explain this car’s features. When you get in the car, you’ll find a Heads-Up Display, a 12.3-inch high-def interactive driver display, and a 10-inch HD touchscreen. It’s hard to compare to this SUV. The Tesla Model X may cost $78,950, but it’s one of the safest SUVs you can find. It has impact protection on the front and the side. The Model X also has an extremely low risk for rolling over. Even though it’s a fully electric car, it’s got 518 horsepower. The Model X can go 0-60 mph in only 2.9 seconds, making it the world’s quickest SUV. The Tesla Model X is packed with more features than you’d expect and even some you don't. Those falcon wing doors can be finicky. After a redesign last year, the Buick Enclave comes into its own. With a starting MSRP of only $40,000, the Enclave is the cheapest offering on this list of luxury mid-size SUVs. It may not have the fastest speeds or the most powerful engine, but this mid-size Buick SUV still handles trips around town capably. Standard offerings include a 3.6L V6 engine with stop/start tech, keyless open, push-botton start, and Quiet Tuning-branded soundproofing. The Blazer is back, but it looks much different than before. You might remember the Blazer of old as a small truck-like body-on-frame model, but this year's revival officially joins the crossover family. We're a fan of the sporty aggressive styling that takes cues from the Camaro, but we also concede that it can be polarizing depending on your aesthetic taste. The Camaro inspiration continues on the interior where circle air vents dot the dash. We are a lesser fan of those. With resposive and capablel handling, the Blazer is sure-footed around town. Beware, though, once you leave the base trim, prices quickly increase. While they encroach on the luxury prices of other models on this list, the Chevy just doesn't have as many of the luxe features. The latest Mercedes-Benz GLE starts at $56,200. That's actually pretty affordable considering all the tech that comes standard. The instrument cluster and infotainment input are all on a single broad console touchpad that runs across the entire dash. Apple CarPlay and Android Auto are, of course, standard. Dynamic driving modes give drivers the option to choose between styles including ECO and Sport. And new for 2019, there is a 2-person third row. The 2019 Maserati Levante feels like a sports car. It’s got twin-turbo V8 engines that give it 590 horsepower and 0-60 mph speed in 3.7 seconds. The inside is about as luxurious as a car can get. Leather seats are standard, but this SUV can also come with silk upholstery. The Levante starts at $75,980, and it’s worth every penny. The Range Rover Sport is one of the best SUVs that Land Rover offers. It's a $68,750 high-performance vehicle filled with the top-of-the-line features. The Range Rover Sport’s warm leather interior has an updated steering wheel that puts regularly used features at your fingertips in all new ways. It also has an 11-speaker sound system, 10-inch infotainment screens with InControl Apps, and voice control. It’s an SUV designed to bring you into the tech age. At $43,670, the Lexus RX is cheaper than most of the other luxury SUVs on this list, making it much more attainable for the general populous. It even has a hybrid engine offering for increase fuel economy. Both the drivers and the passengers have lumbar support on their leatherette seats. It even has an available color Heads-Up Display and 12.3-inch multimedia display. This is a great luxury SUV option for everybody. The 2019 Volvo XC90 will redefine how you drive. It has City Safety imminent collision braking and 360-degree cameras to keep you safe as you navigate tighter turns. Park Assist Pilot will parallel park your car for you. On the highway, you’ll notice that Pilot Assist helps keep your SUV at a safe distance from other cars. One of the most notable features of the Volvo XC90 is its plug-in hybrid electric engine option that allows you to commute to work with zero emissions. At $47,700, this is one of the best mid-size luxury SUVs of the year. The 2019 Acura MDX is a $44,300 luxury SUV full of technology you’ll actually use, not just fancy features that you have to pay more for. For example, Apple CarPlay and Android Auto are built into the vehicle. The Milano leather seats are made to be enjoyed. If you fold down the seats, the 90.9 max cubic feet of space you get is more than most SUVs. This is one vehicle you can’t go wrong with. BMW makes great vehicles, so it’s no surprise to see it on this $60,700 SUV on this list. It has a max cargo capacity of 72.3 cubic feet with the seats folded down and 33.9 cubic feet with the seats up, making this an extremely spacey mid-size SUV. But don't get us wrong; this is still a vehicle for a preferred max of five people (even though there is an optional third row). BMW also made sure the X5 has great traction control, adaptive cruise control, and a sleek, tech-filled interior. The refreshed all-new design for 2019 makes this one of BMW's best SUVs that it's ever made, and it rises to the top of our 'Best Of' list. The Porsche Cayenne brings cutting-edge technology to SUVs. It has roll stability to keep you safe and improved air suspension for more comfortable driving. Rear wheel steering helps you navigate tight turns in the city and handle high speeds on the interstate. Its adaptive cruise control is a step ahead of other cars’ offerings. The LED matrix beam headlights steer with the front wheels. Starting at $65,700, it’s one of the best luxury SUVs of the year. Porsche even offers a Cayenne E-Hybrid, a plug-in electric version of this impressive SUV. You can get the luxurious 2019 Audi Q7 starting $53,550. This is a beautiful SUV designed with you in mind. It has 5-star safety, all-wheel drive, and Audi Pre Sense City, which will help prevent crashes at speeds of up to 52 mph. If you’re looking for a safe SUV, this is the choice for you. It's mix of safety, well-equipped features, and pleasant driving experience make it our top choice when it comes to mid-size luxury SUV.